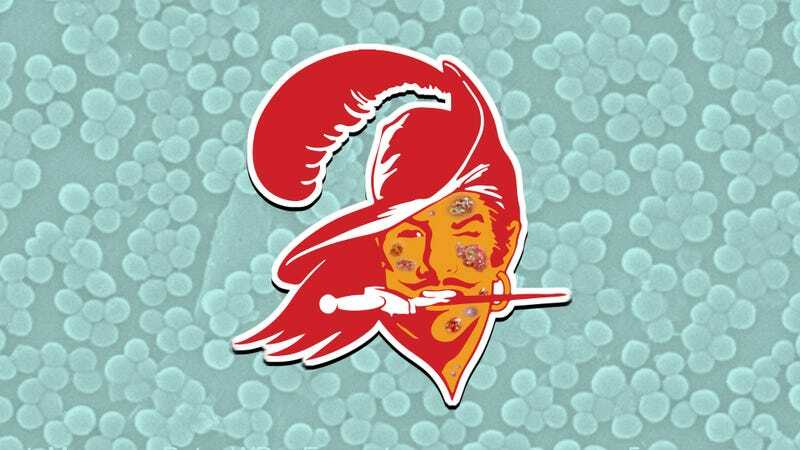 Another Buccaneer has come down with methicillin-resistant staphylococcus aureus, or MRSA (commonly pronounced "mersa"), because apparently playing for the Buccaneers is like rinsing a paper cut in a septic tank. But what is MRSA? Commenter SponsoredByV8 has written a comprehensive explainer of what MRSA, which you can find below. It's a fascinating read, and I recommend going through it. Here are a few of the broader points about the infection, though. 1. It's an antibiotic-resistant strain of a regular staph infection. You probably have some concept of a what a staph infection comprises. For the uninitiated, simply, staph bacteria—s. aureus—resides on your skin, harmlessly. Infection only occurs when it infiltrates an open wound (or a surgical incision). 2. It is DISGUSTING. Really. I'm explicitly telling you to not google image search for "MRSA abscess." Don't do it. Do NOT. OK, are you done not doing that? Great, now that you've spent the past five minutes screaming in abject terror and vomiting all over your keyboard because you can't follow simple instructions, click on this video if you want to ruin the rest of your evening. The most common symptoms you'll see from an MRSA infection are open wounds that don't heal, and boils on the skin, and abscesses. In rare cases, however, it can cause necrotizing fasciitis, which is exactly what you think it is. Staph can be expressed as skin infections, endocarditis (infections commonly on the heart valves), osteomyelitis (bone infections), pneumonia, or systemically in bacteremia and sepsis. In systemic cases, infected abscesses can form in any organ, but now we’re just piling on. This is awful enough to think about on your skin, but it happening to your organs from inside your body? Christ. No. Gaaaahhhh. 4. Contact, skin-to-skin sports (football!) can spread the infections aggressively. Well, obviously. But it's more disgusting than it sounds. In 2003, in the middle of a Rams outbreak, players on opposing teams began coming down with MRSA infections, which were later thought to have originated from sharing the same playing surface as infected Rams players. Comforting for any visiting players in Tampa Bay this season. Hospitals are commonly seen as fertile breeding grounds for the bacteria, and that's true. Football locker rooms and training facilities, however, aren't far removed. Benches, towels, equipment—there are just tons of surfaces that multiple people are coming into contact with. You can see how easy it is to spread infections around. That's the 40,000-foot view of MRSA. If you're interested in the rest of the medical nerd details, they're just below.